In the year 1291, Vandino and Ugolino Vivaldi, the Vivaldi Brothers, set sail from Genoa through Gibraltar to the Atlantic Ocean with the intention of reaching India by sea. They were never seen again. 200 years later, on October 12, 1492, Christopher Columbus arrived in the Americas. Had the Vivaldi Brother been successful, the suffering of the indigenous peoples of the Americas in the hands of European colonists would have begun 200 years sooner. Epidemics of smallpox, typhus, influenza, diphtheria and measles, introduced by European settlers, wiped out up to 95% of the indigenous population of the Americas. Those who survived the epidemics of disease were slaughtered, exploited and displaced. They were robbed of their wealth, livelihoods, culture and freedoms for centuries to come. Only now we are beginning to appreciate the complex cultures of Indigenous Americans and their innovations and inventions: Advances in architecture, medicine, mathematics, astronomy, writing, calendars, fine arts, intensive agriculture, engineering, and complex theology. Unfortunately most of this is forever lost. 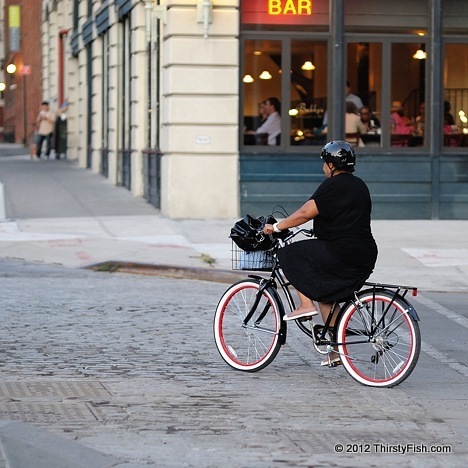 What does a lady on a bicycle exploring DUMBO have to do with the Vivaldi Brothers, indigenous peoples of the Americas, or neocolonialism? Funny, I was asking myself the same thing: Ubuntu, "I am what I am because of who we all are". I wish that we could explore places, cultures, ideas and the world as this lady is exploring DUMBO.